Tulip Light and Dreamy (Tulipa hybrida) is a true dream in the garden and pots. Lavender pink petals are highlighted with a pale pink edge, creating a beautifully romantic picture. Darwin Hybrid Tulips have vibrant colours, large blooms and strong tall stems, along with a perfect triangular shape when closed. This makes them the most popular cut flower variety. Tulips prefer a full sun to part shade position and are ideal for pots and containers. Plant the bulbs when the ground begins to cool in late April – May if required place the bulbs in the crisper in aerated plastic or paper bags (away from fruit) 4-6 weeks prior to planting. Flowers mid – late spring. Mid season flowering. Positioning: Full sun position, but can be grown in a position that receives at least half a day of full sun. General Information: Suitable for temperate/dry and Mediterranean climates. Require winter chilling in warm climates. Watering: Tulips like to be kept cool and moist but not too wet. After planting, water well, and once leaves appear they should be given a good watering every 7-10 days depending on how dry the weather is. During dry times of the year, be sure to water regularly, especially after the buds have appeared. Fertilising: Prepare the soil with a complete organic fertiliser before planting and then use a liquid fertiliser once the buds have appeared and then again after the flowers have faded. Soil: Well-drained soil, high in organic matter. Lifting & Storage: Should be lifted each year. Dig after the foliage has turned yellow. Allow the bulbs to dry out, out of the sun, and then store them in a cool, dry and airy position. Pests: Aphids can be controlled by regular rinsing and insecticide. Tips: Plant in cool weather (late April or May), if required place bulbs in the crisper for 4-6 weeks before planting. 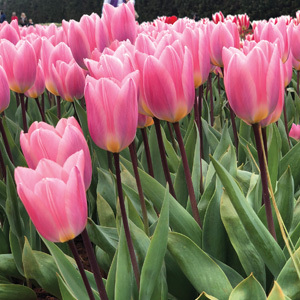 Double, Darwin and Triumph Tulips flower earlier than Single Late and Parrot varieties, so to keep Tulips in bloom throughout the season plant a mixture of early and late flowering varieties. If using as cut flowers choose blooms that are not fully open, cut them early in the morning and change vase water frequently. They like some protection from the wind.